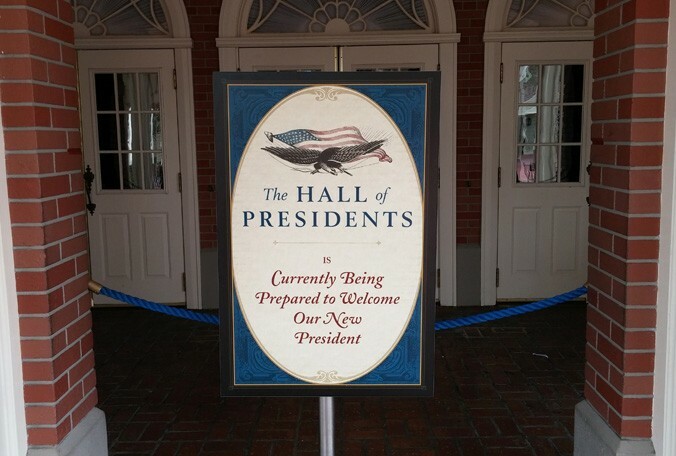 Coming soon to the Disneyland: the Scariest Animatronic President yet. First the disclaimer: I did not watch Donald Trump's Congressional address. I had better things to do: moan and groan over the previous day's root canal and, 24 hours after the damage was done, finally feel the Vicodin kicking in. Then I watched some TV with Amy (Jane the Virgin and an extremely disturbing episode of Girls), before retiring to the bedroom to write yesterday's blog post. Everything I know about the speech I gleaned from Slate and the New York Times. And here's what I learned: Trump stuck to the teleprompter, dutifully reciting the words he had paid someone to write for him, only straying once or twice from looking and sounding presidential. Although the content of the speech was boilerplate Trump (vague promises about replacing the ACA with something that covers everybody just as well, but for less money; nonspecific admission that racist and anti-semitic incidents are a problem; and a menacing con job about establishing an agency dedicated to prosecuting immigrant crimes against citizens (although statistics demonstrate it is immigrants, far more than American citizens, who are much more likely to be the victims in criminal encounters with each other). This single performance--following a month of blunders, Twitter rampages, declaring war on the press, scandals both domestic and foreign, resignations by nominees and appointees, a staffing process slowed to a crawl by loyalty tests, briefings that favor slanted right-wing media over mainstream balanced reporting, lies upon lies upon lies, a constantly mutating foreign policy that has world leaders hiding under their desks, and so much more that I could fill pages with it--was enough to convince Van Jones of CNN that here, at last, was a President. Mind you, there's a petition gathering signatures requesting Disney to refrain from adding robo-Trump to the show. I think that would be a mistake: if ever there was a President who belonged in a theme park, it's Donald Trump. As I read about his performance before Congress, I couldn't help thinking about Avonlea Village, a theme park on Prince Edward Island that seeks to replicate the world of Anne of Green Gables. The park is a Disneyesque representation of Victorian Canada. I visited with my parents and children in 2003, and was at first amused by the wandering reenactors, most of them obviously older than the characters they were portraying. Soon I realized that their performances were missing something: the heart so evident in the filmed versions of the story (and, I assume, even more so in the books, which I must admit I have never read). Mind you, one cannot expect stage quality performances from college students working a summer job, but still, everything I saw fell more into the category of caricature than drama. The only authenticity I felt that day was in a spirited performance of Acadian music--though it led me to wonder if the genre was accurate to the time and setting of the Anne books. This came a day after we had visited Sherbrooke Village, a historically accurate reenactment site where 19th century crafts are performed, and visitors can stroll without fear of being accosted by rowdy characters. The contrast was striking: here were people, many of whom lived on site, working as their predecessors had 150 years earlier. Three guesses which of those tourist activities reminds me most of our President. Donald Trump is a cartoon of a President, a character out of a satirical political thriller. It's hard for me to imagine a Secret Service agent taking a bullet for this man who treats every appearance like a scene from a reality show. I'm reminded of how, in Back to the Future, Doc Brown of 1955 reacts to learning that Ronald Reagan is President in 1985: "The actor? Then who's the Vice President? Jerry Lewis?" But yes, it has come to this: a White House more ludicrous than the Reagan/Lewis administration. Trump is praised for acting presidential for an hour, all the abuse he has dished at CNN forgiven for his ability to read a speech, no matter how duplicitous and sinister that speech might be. His advisers made sure the address had all the trappings of previous Presidential addresses: invited guests in the balcony, mostly dignified presentation, actually rehearsed words. All that window dressing disguised the identity of those guests: the grieving widow of a Navy SEAL whose death has led his father to demand an investigation; and the carefully selected families of victims of crimes committed by immigrants, providing Trump the platform to establish yet another bulwark against the arrival of people who actually want to live and work in this increasingly inhospitable nation. But that's all beside the point: last night, for an hour, we had our animatronic President. It must have been agony for him to keep his egomania in check for that long (witness the improvised line about the dead Navy SEAL looking down from heaven and approving of the ratings): once it was over, he wasted little time looking up positive reviews, which then unleashed a Twitter storm of gratitude to the pundits who were taken in by the sales pitch. Yours truly not included; but then, the 30 or so of you reading this should not be surprised by that. I hope Disneyland goes ahead and adds the animatronic Trump to the Hall of Presidents. I'd love to see what reactions it gets. On the other hand, they don't really need him: the Matterhorn ride already has an abominable snowman, and one scary monster is plenty for the Happiest Place on Earth.